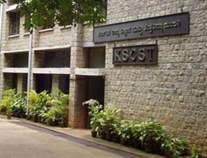 Karnataka State Council for Science and Technology in collaboration with Nisarga Mahila Samaja and local Schools is organising 24 Quiz and Debate programs private and Government High Schools in Bangalore. Selected 50 to 80 students and few teachers are participating in the program in each school. The programme for quiz and debate is scheduled for around 2 hours. The program arrangements began with the display of rainwater harvesting posters in the respective schools for providing information and creating awareness on rainwater harvesting and water conservation measures among students and teachers of the school. A 15 minutes documentary video on rainwater harvesting is screened at each school. Participating students are studing the display charts and watch the documentary film on RWH. A.R. Shivakumar, Principal Investigator, RWH, and KSCST staff are providing valuable inputs to the audience on RWH and water conservative measures. Simple tips for the students participating in the quiz programme will be provided by the members of Mahila Samaja. The students aregrouped in to ten or more teams, each team consisting of 5 students. Among 5 students, one student is selected as the leader of the team to represent the team placed at the center, and he/she is allowed to answer the questions on behalf of his/her team. Two quiz masters conduct the program and three judges will updated the score boards of all the teams. The quiz questions are read once and repeated again along with the multiple choice answers. Ten seconds time is given for each team by turn to answer each question. Winners of the quiz competition are selected for the debate. All the five students of the winning team are asked to prepare for participating in the debate. One minute per student of the winning team is allotted for speaking on RWH and other water issues. The winner of the debate is announced as the "Super Winner" of the team. A Titan watch is awarded for the Super winner and the remaining 4 prize winners are awarded with the Parker pens. Senior officers of KSCST and other institutions are the Chief Guest to distribute prizes. Certificates are distributed by the members of Nisarga Mahila Samaja.